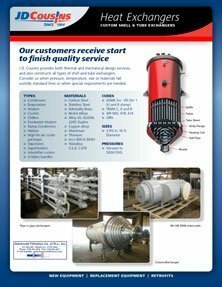 Advanced Filtration Company sells the full line of JD Cousins Products from JD Cousins heat exchangers to distillation columns and evaporators. JD Cousins specializes in equipment for the chemical processing, pharmaceutical, paper and pulp and power generation industries. J.D. Cousins constructs all types of shell and tube exchangers. Heat Exchangers – Consider J.D. Cousins when pressure, temperature, size or materials fall outside standard lines or when special requirements are needed. Steam Condensers – J.D. Cousins’ skid-mounted equipment can be pre-piped and wired to meet your system requirements. Components may include structural skid base, condenser, condensate pumps, air removal equipment, piping and valves, controls and instrumentation. J.D. Cousins specializes in designs that will minimize handling and field installation. Savings in labor and simplification of project scheduling can be expected. Distillation Columns and Evaporators – a wide range of materials and diameters to suit each process requirement including the use of many different types of column internals. Pressure Vessels – quality tanks, pressure vessels, and processing equipment constructed for all industries and OEM’s to rigorous specifications. API 650 and 620 Tanks build in a wide range of sizes and materials with many options including ladders, platforms, manways, and various types of anchor supports up to of 12 foot diameter and 80 Foot in height/length. Vessel Repair and Modification . We help find the cause of any problem and provide expert cleaning and repair of your unit, saving you money and ensuring optimal performance. Also, repairs can be performed on all types of equipment regardless of original manufacturer and can usually be scheduled for shutdowns. Skid and Modular offering single source responsibility when packaged systems are desired. Request a quote on Heat Transfer and process equipment.